Phanteks introduced the TC14PE, a new CPU cooler with a copper base, five 8mm heatpipes and a large aluminium fin array that is cooled by two 140mm fans with an airflow of 130m³/h (76.57CFM) at a noise level of just 19dBA. Pricing is 79.90EUR over at Caseking, and you can get the cooler in four different colors. Finally available: The high-end CPU-Cooler from the newcomer PHANTEKS is available immediately at Caseking.de. This cooler with the name „TC14PE“ already managed to receive numerous awards for its excellent performance. PHANTEKS employs multiple features to achieve such extraordinary results: a patented surface at the nano-level, twin tower design and two high-performance 140 mm fans. For the perfect looks to go with the installed hardware, the cooler is available in blue, orange red or silver. The young company PHANTEKS has invested more than two years into the development of the TC14PE CPU coolers, as their goal was not simply to produce a good CPU cooler, but to lead the performance charts. Instead of focusing on the best heat dissipation of an open test bench, PHANTEKS has made sure that the TC14PE performs best in its intended setting - a closed system. To achieve this incredible level of performance, PHANTEKS utilizes numerous groundbreaking new technologies. While the TC14PE cooler also offers a large overall size - much like most other high-end coolers, but the potent new aspects are found in the small details. Both the main features only become visible when looking closely at the cooler. One is the „Cold Plasma Spraying Coating Technology“ (C.P.S.C), which increases the surface area at the nano-level on the surface of each separate fin. This increases the overall dissipation area, further reducing the temperatures. This technology is even more important at all connecting points between cooler base, heat-pipes and individual fins, as these traditionally tend to be the weak links in the chain of heat dissipation. But the second technology is the surface to enhance thermal conductivity by the name of „Physical Anti-Oxidant Thermal Shield“ (P.A.T.S). This surface reflects heat coming from surrounding hardware like the graphic card, chip-set or memory instead of adding to the temperature of the material. This technology is especially beneficial in a closed system in which such a cooler is traditionally used instead of open testing stations. The TC14PE utilizes five 8 mm thick heat-pipes which spread the heat evenly to the two large cooling towers. These are available in various different colors, so that it fits the style of the entire system. In addition to the colored coolers, PHANTEKS also includes fitting fans in these colors. The cooler is currently available in blue, orange, red or silver. PHANTEKS includes two 140mm fans with these coolers, with the possibility to install a third one right out of the box. The fans are also available separately and ship with a patented thermal bracket, which allows for the installation of the fan in various locations of a chassis. Besides the large dimensions of these fans, which already allows these to move an exceptional amount of air while generating very little noise, PHANTEKS has engineered the fins in such a matter to further increase the fans efficiency. The resulting 130 m³/h at a mere 19 dB(A) is certainly not a statement to be taken lightly, but for those who would like to reduce the already quiet operating noise of these fan even further, PHANTEKS includes a pair of „Quiet Speed Adapters“ Q.S.A. These reduce the rotation speed from 1200 RPM to a mere 900 or 750 RPM respectively. while still pushing over 100 m³/h at 15.2 dB(A) and 76 m³/h at just 13.4 db(A). These numbers can also be attributed to the high-quality UFB bearing, which also increases the overall live span to an impressive MTBF of 150.000 h.
Last, but not least, the PHANTEKS TC14PE cooler is future proof, thanks to the SolisKu mounting kit. It does not only support all current sockets from AMD (Socket FM1, AM3+, AM3, AM2+, AM2) and Intel (Socket 1366, 1155, 1156, 775), but also allows for installation of the cooler on the upcoming LGA 2011 socket found on Intel X79 based motherboards. 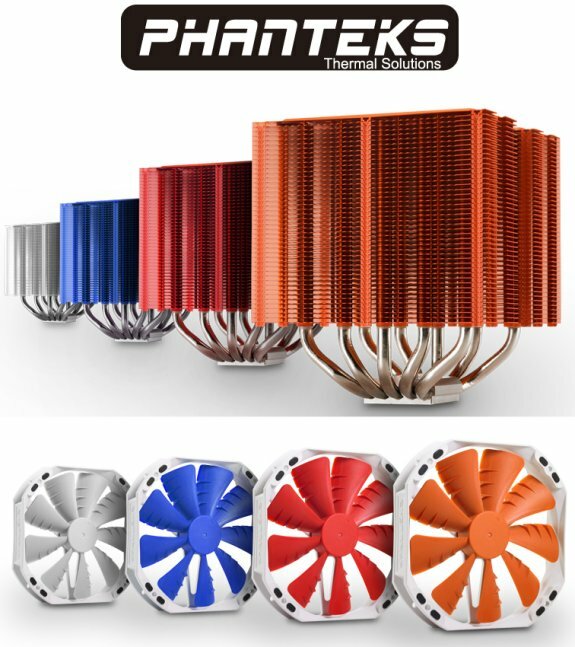 The PHANTEKS PH-TC14PE CPU Cooler in the blue, red, orange and silver is available immediately starting at 79.90 Euro exclusively at www.caseking.de.